This handy carry-all is the perfect way to store all your important items. Give this drawstring backpack away at trade show events, college events, company picnics and to business professionals. 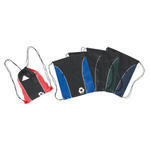 Features a large front zipper pocket and contrast nylon accent in black, forest green, navy, red and royal.